From the village of Rotoava, we started to head south. 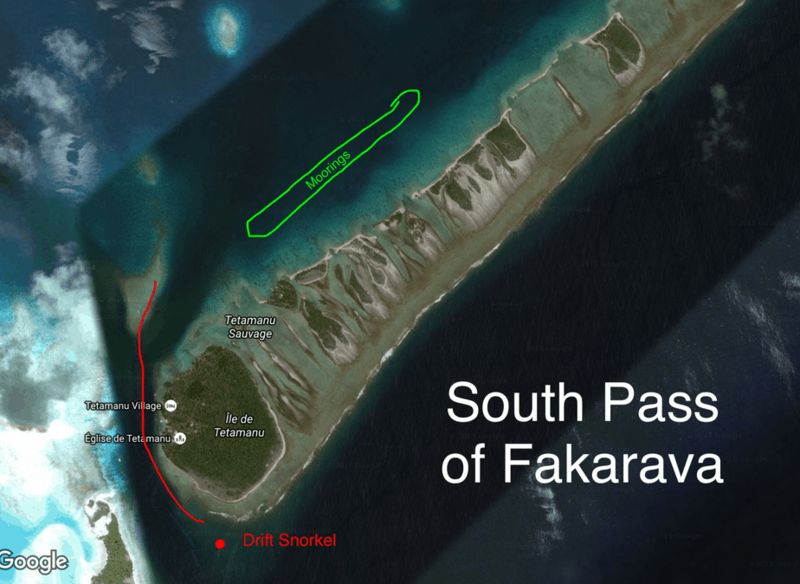 Fakarava is a long atoll – 30 miles long. There is a channel that runs from the village to the south pass. The compendium has three areas listed where you can anchor on your way down. The first is about 15 miles from the village. We actually didn’t make it that far. About a mile from the intended anchorage we found Carthago, so we pulled up and anchored next to them at 16° 13.871 S and 145° 33.505 W. There was free wifi for a little while, but it disappeared after a few hours. My big goal was to snorkel, and in the early afternoon we picked Jose and Gina up in LD and took off. Just to the south of us was a point of beach, with lots of coral around it. We anchored LD in sand and took off. There was a ton of coral to check out, and we saw an eel (great spot by Jose), a barracuda, and some sharks…but not as many sharks as we’ve seen elsewhere. The coral was great, lots of medium sized coral heads. That night Carthago invited us over for a movie night. They have a projector and screen in their boat – a pretty sweet set up! We watched Steve Jobs and ate birthday cake (Jose’s birthday was the 28th). The next morning Blue Raven came up an anchored, and Carthago took off. We had a quick chat with Blue Raven, as we don’t think we will see them again for a little while. Then we took off. We stuck to the channel and kept going toward the south pass. We were planning to anchor somewhere, but decided to pick up one of the free moorings instead. As we approached, our friends S/V Swiftsure (Lanny & Ginger) popped up on AIS. We met Swiftsure back in Panama at Shelter Bay, and saw them go through the canal. Swiftsure spent longer in Panama then we did and then sailed immediately to the Marquesas. Like most cruisers around here, they are members of the Pacific Puddle Jump. Once we settled into our mooring, David and I popped in the water for a snorkel. The water was clear and there are lots of bommies around. The beach looks to be rock and shell though instead of sand. We did see sharks again…mostly black tipped reef shark, but also one gray reef shark. We also saw HUGE groupers….maybe not goliath grouper size, but pretty dang big. We invited Ginger and Lanny over for sundowners and enjoyed a long chat. We had our underwater lights on, and after they left, we spotted some sharks circling us. It’s always entertaining to watch, especially when I throw some bloody meat scraps in the water! Wednesday Lanny and Ginger picked us up at 11:15 to head out for a snorkel. We were trying something new for us – drift swimming (or diving). Fortunately Lanny and Ginger have done this before, so we got to bask in their expertise. We took their dinghy out to the outside of the pass (there was a mooring ball). We all jumped into the water and started to drift. We timed our excursion so that the current was at slack, so we didn’t just float along….we swam. We took turns holding on to the dinghy to keep it with us. We swam back into the atoll, keeping over a ravine in the sea bed. Up the side of the ravine was a wall of coral. We did see a few sharks, wrasse (please google it so you can see these bizarre creatures), grouper, parrot fish, unicorn fish, and other reef fish. The water was very deep…50 feet? The sharks were hard to spot, but we could see them swimming way below us, or even resting on the seabad. However, the fun for me really hit once we arrived on a coral plateau. The water was about 20 feet deep and crystal clear. The plateau is just to the north of the ravine, and where they meet is a drop off. We swam back and forth between the drop off and the plateau. The plateau was amazing….the bottom was jam packed full of coral as far as the eye can see. Due to the shallow depth, it was much easier to see the coral and fish. And the sharks! We had up to 20 sharks swimming above the coral. They didn’t have any interest in us and kept to the bottom of the water. I did get to see about 10 of them congregate and then chase after a grouper! Fortunately for the grouper he got away. I think the plateau was the best snorkel I’ve ever had. When we have reasonable internet I’ll try to update and post a map of this location. Afterwards we stopped by SH to toss our gear aboard and grab ourselves some drinks which we took over to Swiftsure. Ginger had made banana bread, which she cut up for us to snack on and then sent some home with us! The afternoon (or what was left of it) was devoted to reading and boat projects….David re-bedded a stantion that was leaking into our guest cabin, and I helped! We had talked about leaving Thursday for Tahiti, but overnight and into the morning the weather was nasty…very squally. We decided to sit it out and have a movie day. Also, our friends on S/V Beachouse, Scott and Nikki, who we met back in Shelter Bay arrived. We dinghied over to chat and also got to meet S/V Blowing Bubbles, whom we have seen off and on since the Perlas Islands in Panama. This morning, it’s still windy with a few squalls blowing through, but it’s much better. We are now off for Tahiti! Should be arriving on Sunday into Taina Marina. We have enjoyed following your journey and I was wondering if you would share wit us the name of the cruising guide you are currently using in the Pacific and does it take you all the way to the Australian East Coast. Hi Gordon! Great to hear from you. While we bought two cruising guides, I’d say don’t bother. Download the Soggy Paws Compendium. Where are you guys? What are your plans? Calm seas and fair winds! 9 days and counting! Can’t wait to see pictures. 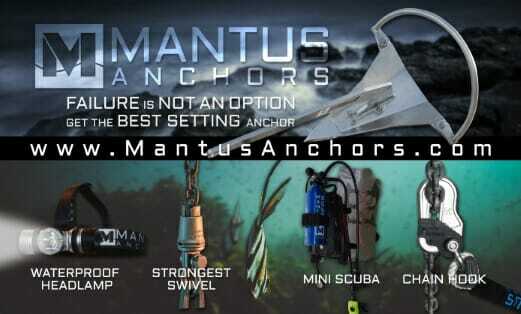 And for you to visit!